Check your pet's proof of vaccination rabies certificate! 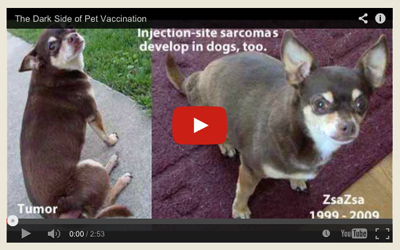 Can vaccines adversely affect pets? YES, although rare, it can happen to your pet and it can be serious, even fatal. It has been proven that vaccinating for rabies every 2 years does NOT offer more protection or increased immunity. The most common excuses vets use for vaccinating every 2 years is that "pet owners are late in getting the booster" and "more vaccines offer more protection." Both of these excuses have been proven to be invalid. Having pet owners pay for medically unnecessary rabies vaccination every 2 years, from which the animal derives no benefit, raises ethical and legal issues. Giving pets rabies boosters annually or biennially following the initial series is contrary to all national guidelines set by professional veterinary organizations. National guidelines reflect considerable consistency in global vaccine perspective which facilitates a global standard of care for recommendations and administering vaccines. "Vaccinated animal means an animal that has been vaccinated in compliance with the Compendium of Animal Rabies Control issued by the National Association of State Public Health Veterinarians." What is the Compendium(download PDF)? It is the national standard set by the CDC's National Association of State Public Health Veterinarians, Inc. (NASPHV) All states recognize the Compendium for it helps facilitate standardization among jurisdictions, contributing to national rabies control. There is no state that requires rabies boosters biennially. "No Laboratory or epidemiologic data exist to support annual or biennial administration of 3-year vaccines following the initial series." The simple truth is administering rabies vaccine every 3-years saves pet owners money, decreases the risk of an adverse reaction and protects the pet from the pain of an needless injection. See video, Dr. Karen Becker interviews Dr. Ronald D. Shultz, "Does your pet really need that rabies shot?" Some ND cities require dogs and cats to be vaccinated for rabies, after their initial series, WITHIN 24 months. It appears, historically there has not been enough communication between USDA, ND veterinary boards, ND public health agencies, local veterinarians, and city officials. City officials simply do not know about USDA biologics jurisdiction and current rabies vaccination protocols based on science. The rabies over-vaccination practice happened in Minnesota. Because of the diligence of informed pet owners requesting change, the MN Board of Veterinary Medicine and The MN Board of Animal Health educated veterinarians by establishing a rabies vaccination guidance document. Veterinarians across the state changed their method of practice to be in compliance with state and federal vaccination law already in place, adhered to specifications of manufacturers' labeling, informed consent, consumer protection laws and the recommendations of all professional veterinary organizations and associations. The major outcome was MN veterinarians must now disclose a pet's rabies vaccination duration of immunity to the client and document the correct 3-year duration of immunity according to manufacturers' labeling on the issued certificate. Furthermore, MN pet owners were allowed to have their 2-year certificates amended from the 2-year date to correctly state the 3-year duration of immunity. .
North Dakotans...If your pet received a 2-year rabies certificate and was not told it was a 3-year duration, this practice lacks informed consent. AVMA adopts policy on informed consent. Contact the ND Veterinary Board of Examiners. Don't let this rabies over-vaccination practice continue. Contact the attorney general for an investigation into why rabies over-vaccination protocol continues to be practiced in North Dakota when it appears to be in conflict with scientific evidence, federal law, national guidelines, and vaccination/consumer protection laws in place. And ask for rabies certificates throughout North Dakota to be amended to correctly read 3-year duration! Our Flyer: Urgent, before 6/9! "Modern elements of informed consent for veterinary practitioners"
American Veterinary Medical Association's Principles of Vaccination (PDF) States, on page 5, ""Unnecessary stimulation of the immune system does not necessarily result in enhanced disease resistance, and may increase the potential risk of post-vaccination adverse events" . " YOU ARE ENTITLED TO INFORMED CONSENT The pet owner has the right to be given informed consent and theveterinarian has the legal obligation to provide it. Informed consent means the medical profession must disclose the benefits and risks of all recommended treatments to the owner before treatment is initiated.The veterinarian MUST DISCLOSE to the owner what the proven duration of immunity of the vaccine is and scientific proof must be provided to the owner if the veterinarian deviates from the accepted standards of practice/standards of care. All veterinarians are governed by what is called a standard of care, or standard of practice. This is a way of caring for patients that has been set by professional associations/organizations that govern the practice of veterinary medicine, along with pharmaceutical manufactures and government agencies. In tort law, the "standard of care is the degree of prudence and caution required of an individual who is under a duty of care." It directs veterinary professionals to "what would be exercised by the reasonably prudent manufacturer of a product or the reasonably prudent professional in that line of work" and "determines whether adoctor is liable for medical malpractice." Veterinarians, like physicians, are to adhere to the generally accepted "standard" of professional medical care... Failure to provide informed consent or adhere to the accepted standards of care/practice not only carries potential legal liabilities, they may also violate ND consumer protection laws. Veterinarians Association, The American Veterinary Medical Association, The American Animal Hospital Association, The Association of Public Health Laboratories, Council of State and Territorial Epidemiologists, The National Animal Control Association. Recent studies are showing the vaccines may retain high levels of effectiveness well beyond the third year. Until protocols and laws change, pets shoud receive shots according to protocol schedules. The findings appear in the Journal of the American Veterinary Medical Association study, "Comparison of anamnestic responses to rabies vaccination in dogs and cats with current and out-of-date vaccination status." It is the first study to present scientific data for animals with out-of-date rabies vaccinations. Please note in Tables 5 & 6 on Pages 208/209 under "Time Overdue for Vaccination (mo)," some dogs were 2, 3, and 4 YEARS overdue for a booster. Also see: The Rabies Challenge Fund, "The first of the final challenge phase of our research has been completed." "The goal is to extend the required interval for rabies boosters to 5 and then to 7 years." False. ND does not have a state-wide rabies mandated vaccination law for dogs cats, regulation of rabies vaccination is left up to municipalities, cities and counties. Often regulation is in the form of a mandatory city rabies license. True. ND law specifically regulates the frequency of rabies vaccination, as well as who may administer, and the jurisdiction of the recommendations of biologics (vaccines). Many veterinarians are unaware of North Dakota Century Code Title Chapter 23-26 Rabies Control 23-36-01-11 the rabies vaccination law in place that states, "Vaccinated animal means an animal has been vaccinated in compliance with the Compendium of Animal Rabies Control issued by the national Association of State Public Health Veterinarians." ND Board of Animal Health's newsletter Animal Health News, spring 2010 heading entitled "Rabies: a vaccination reminder", warns vets that, "Rabies vaccination must be done according to label directions. Any deviation from label direction and from the recommendations in Compendium of Animal Rabies Control from the National Association of Public Health Veterinarians may not be supported legally." Read article this quote was taken from(Animal Health News, Spring 2010). A veterinarian not acknowledging the vaccine has a three year duration may be in conflict ND law, ND Board of Veterinary Medicine Guidelines, the compendium, and medical standards of practice. The ND Board of Animal Health acknowledges the rabies vaccines's manufactures three year duration of immunity. Medical Negligence as it Applies to Vaccination Decisions. "The basic scenarios that could potentially give rise to a clam or lawsuit are where...2) a patient experiences an AE attributed to a vaccination later considered unnecessary by the client. 6. Veterinarians should not adopt rabies vaccination recommendations and protocols base soley upon local/regional animal licensing ordinances which prescribes rabies vaccination frequency. It is the animal owner's responsibility to meet the requirements of local/regional annual licensing requirements. Licesing agency for veterinarians; protects welfare of public/animals; handles official complaints. Please read what is negligence and standard of care and informed consent and statutory authority USDA. Rabies vaccine is different from all other vaccines and falls under federal jurisdiction "...states are not free to impose requirements which are different from, or addition to those imposed by USDA regarding the safety, efficacy, potency, or purity of a product."